It's all about code: Barbie geek ! 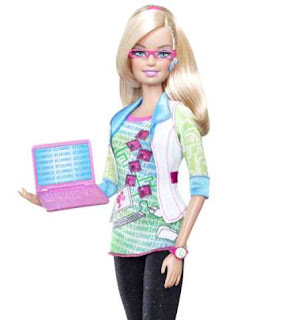 There is a new Barbie doll that came up couple months ago : the computer engineer ! or should I say the Barbie Geek ? Well all that to say that IT, is definitely an area of men. But apparently, it is not always have been the case. In the 80's, there was about as many women as men in the IT field - what was 80's IT anyway? perforated cards ?. Some say that it was because computer had keyboard, and therefore linked to the type writing activity - activity linked to the female gender. I believe on the contrary, that it is more a transformation of our society that change a non gender specific activity to make it a male dominated field :towards the 90',s it then became almost exclusive to men. In the 80's, PCs became part of the house, and male fascination of the machine combined with gaming experience, led a bunch of boys naturally attracted towards the computer (including myself), wanting to know how that game worked, maybe trying to code their first game. This led them naturally to an IT career, wanting to go on and work on The Machine aka computer. Then on the computer class, that led of a difference of level : more at ease with the computer through their home hacking, that often discourage their female counterpart. It does not mean that they would be better students, even probably the contrary since they will not empty their cup. A later obstacle for a girl to pursue an IT career is the image of the IT student: a social image of someone sitting in front of a screen 24/7. Not very appealing for a girl, and neither for her parents. Women apparently have a different view of IT career, wanting to code for a real application like, for example medical research. In the meanwhile, in other scientific areas, the trend is to tend towards at least an equilibrium, alas not in IT.